The travel industry is ever on the lookout for creative mash-ups and newest things. Take the "poshtel," for instance, an upgrade on the cheap, no-frills backpacker hostel. While the staying power of that category remains to be seen, glamping, another hybrid concept, appears to be here to stay. As with the poshtel, glamping is a mishmash of a time-tested experience with a glamorous tweak: outdoor camping injected with convenience and luxury. No need to bring the tent—it awaits your arrival. Instead of stiff camping mats, there are plush beds with high-end mattresses. Elegant gas lamps replace flashlights. While it's not as cheap as a sleeping bag on the dirt, glamping does offer lower prices than the brick-and-mortar hotels it imitates. 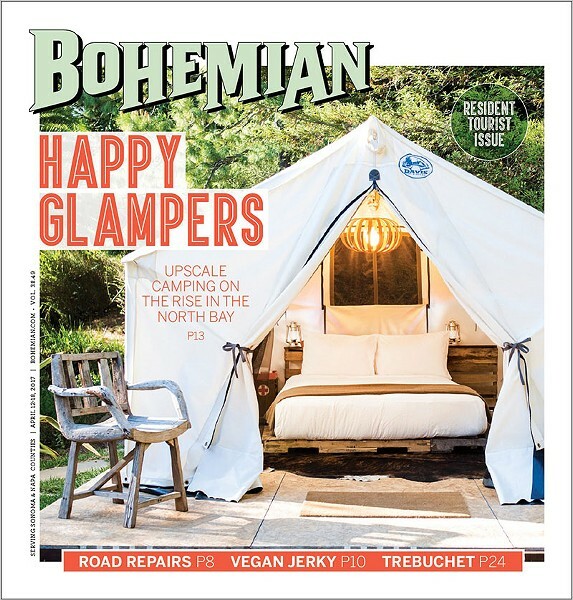 Glamping, which might involve sleeping in a yurt or a vintage trailer, has been enjoyed outside the United States for years, but the trend has only recently taken root in the North Bay, as innovative hoteliers meet the rising demand for lodging. Last year, Terra Glamping established a pop-up lodging experience on the Sonoma-Mendocino border, just above Timber Cove, with ocean-view tents, memory foam mattresses, cooking facilities and embroidered rugs to complete the experience. Breakfast and coffee are served in the morning, and in the evening there are s'mores by the campfire. A number of Napa Valley wineries have taken to the quick setup of glamping tents and provide an alternative to sleeping among the vines. Charles Krug Winery in St. Helena started to offer tent stays on its lawn last summer as part of a private wine-industry event. A similar, albeit seasonal, offering can be found at Pope Valley Winery in collaboration with Terravello Tours, which specializes in food and glamping experiences. "It's definitely a trend, two decades in the making," says Tim Zahner, chief marketing officer for Sonoma County Tourism. "Safari West in Santa Rosa has had their tents for a number of years, and the Petaluma KOA and the Cloverdale KOA are definitely upgrading their amenities. As people get out and want to experience the outdoors, we are definitely promoting it." Zahner himself might be a "more of an REI backpacker kind of guy," but he can't deny the potential. "As Sonoma County has every kind of lodging, it's good to have a balanced portfolio. You don't want to have too much glamour or too much camping, and glamping appeals to the middle ground and to possible shifts in the economy." Crista Luedtke, the owner of Boon Hotel and Boon Restaurant, was there first. This season, running May to October, will be Boon's fourth year with glamping. "Since we constantly had to tell people we were sold-out at the hotel, I thought of adding these amazing tents, but didn't want to cramp them," she says (Boon makes only three tents available for $140 a night). "We already had the bathroom and shower building that we've been using for events, so it's almost like having your own facility, plus all the amenities are the same—the pool, breakfast in your tent." For hotel operators like Luedtke, the flexibility and ease of tents are attractive. "It's been a great way to add more accommodation without adding buildings, Guerneville being a seasonal destination," she says. A newcomer to the Russian River, Autocamp also offers "luxury tents" with power outlets and plush linens, as well as a slightly more permanent yet still camping-inspired solution: vintage, refurbished Airstream trailers. Starting in Santa Barbara in 2013, Autocamp's funky premise is in the spirit of glamping, turning something familiar and old-school into something new. Co-founder Ryan Miller said he discovered the Guerneville location on a scouting road trip. "I fell in love with the town, not knowing what to expect prior to visiting," he says. It took the company 14 months to buy the riverfront property and build the clubhouse where guests can purchase snacks and sit by a fire pit. Autocamp's tents and trailers range from $190 to $350 a night. There's nothing new about yurts, but Napa County's Bothe State Park brings them to a new audience in wine country. The park added the three yurts in 2015 and joined the Outbound Collective, an online community similar to Airbnb for outdoorsy types. Bookings provide links to nature experiences. For $70 a night, visitors hiking the Coyote Trail or visiting the state park can rest on a comfortable bed while still being able to hear the outside world. Meaghan Clark Tiernan, a 30-year-old writer from San Francisco, stayed in one of the yurts soon after they launched. "Compared to the tent, it was much nicer," says Clark Tiernan. "The yurt was cozy, so you didn't need extra layers. We had much more room to spread out, change, and it was still camping in the sense that you were cooking your food outside on the fire." While the Bothe yurts are on the cheaper side, the prices at other glamping destinations are steeper than the average camping site. So who goes glamping? Adventuresome folks generally in their 40s or younger, says Luedtke. Inbal Itachi, 35, a designer from San Francisco, treated her sister visiting from Israel to Luedtke's glamping experience. "It was especially fun waking up in the middle of nature, in the woods, and getting breakfast in bed," she says, "and spending time at the hotel's pool with drinks and magazines." The fear of getting bitten by insects was her only complaint. Autocamp's Miller says glamping appeals to more than one demographic. "You'll have the millennials that may live in San Francisco, and then folks that grew up with the nostalgia of an Airstream and love the opportunity to stay in one," he says. Travelers are looking for something different these days, he says, "to break the mold" of hotel stays. "What's your favorite thing about a hotel? Design, great mattress, a good shower? What's the best about camping? Being outdoors. We're taking all these and mixing them together," he says. Luedtke thinks along similar lines. "Look, I love to camp," she says, "but it's a commitment. You carry all your gear, spend a couple of hours setting up and tearing down. Or you can just arrive and have access to it all."